Capacitor has collected an initial charge Q0 between its electrodes, thus, it has an initial voltage UC0=Q0/C. Switch X1 is being closed at specific time, thus, current i(t) starts to flow in circuit. Immediately after closing the switch X1 the transient state occurs in electrical circuit, therefore, commutation principles have to taken under consideration. 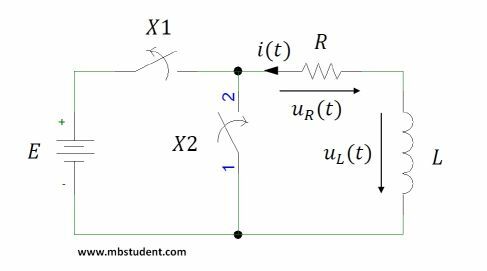 Kirchhoff’s voltage law equation will be written for circuit. General formula for capacitor’s current will be taken under consideration. Capacitor was being charged with to its full capacity and it is in stable state. Capacitor initial voltage is equal to voltage source UC0=E. Switch X2 is being closed and switch X1 is being opened, both switches change their state in the same time. As a result capacitor’s discharging current i(t) starts to flow in circuit. 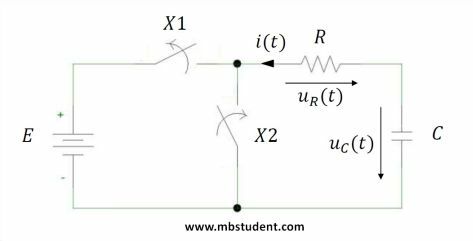 Immediately after closing the switch X2 the transient state occurs in electrical circuit, therefore, commutation principles have to taken under consideration. Kirchhoff’s voltage law equation will be written for circuit. General formula for capacitor’s current will be taken under consideration. Switch X1 is being closed at specific time, thus, current i(t) starts to flow in circuit. 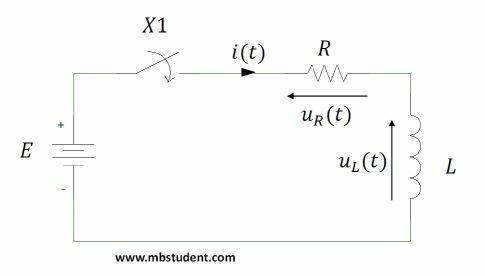 Immediately after closing the switch X1 the transient state occurs in electrical circuit, therefore, commutation principles have to taken under consideration. Kirchhoff’s voltage law equation will be written for circuit. General formula for inductivity’s current will be taken under consideration. Switch X2 is being closed and switch X1 is being opened, both switches change their state in the same time. 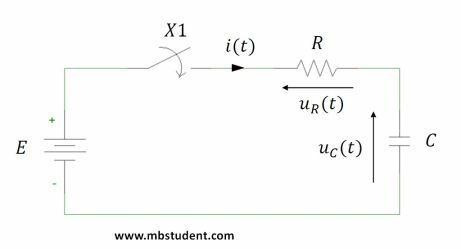 As a result inductivity discharging current i(t) starts to flow in circuit. Immediately after closing the switch X2 the transient state occurs in electrical circuit, therefore, commutation principles have to taken under consideration. Kirchhoff’s voltage law equation will be written for circuit. General formula for inductivity’s voltage will be taken under consideration.